In the virtual world of today, when many people work "in the cloud" and at a distance from colleagues, the concept of what makes a document "legal" has changed, and new technology has changed what types of signatures are acceptable for legal documents. In the law, a counterpart is a duplicate document. The term "counterpart" is used in legal documents to describe a copy of a contract which is signed and is considered legally binding, in the same way as the original. In many cases, several copies of a contract document are prepared, so that all parties and signatories can have a copy of the contract. After signing all copies, all can be considered the same. Language designating what's acceptable as a counterpart, in an LLC operating agreement: "This Operating Agreement may be executed [signed] in counterparts, each of which shall be deemed an original but all of which shall constitute one and the same instrument [document]." Execution by Counterparts/Facsimile. This SOW may be executed and delivered in counterparts by facsimile, each of which so executed and delivered counterpart is original, and such counterparts, together, shall constitute but the same instrument. Each of the parties hereto agrees to additionally execute, and deliver, original copies of this agreement circulated subsequent to its initial execution and delivery by facsimile. A signed original copy of any legal document is always an acceptable counterpart. But what about other types of documents, like faxes, copies of signatures, and electronic signatures? An individual contract might contain specific language about what is considered a legal document, as in the example Statement of Work above. For the purpose of this discussion, the term "counterparts" means "legally binding documents that are recognized in a court of law." A signed fax or scanned and emailed document is often accepted as a counterpart unless it is specifically excluded in a contract. But many government agencies like a county recorder, for example, don't accept faxes and require an original signed document. Signed copies of documents are also acceptable in most cases as counterparts. 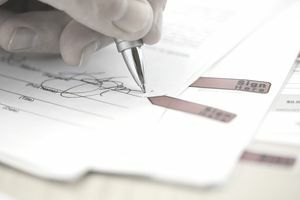 In many cases, the signature may need to be verified by showing a photo ID, like a driver's license with a signature on it. An electronic signature, e-signature, or digital signature is a way to sign a document online. In some cases, you can use a mouse, while in other cases you type your name into the space. electronic records and signatures carry the same weight and legal effect as traditional paper documents and handwritten signatures stating: A document or signature cannot be denied legal effect or enforceability solely because it is in electronic form. But, in the same case as with other types of signatures that are not on originals, e-signatures are not always allowed. Some states require original, written signatures for wills, trusts, adoption, and divorce. And Findlaw says that you won't be able to use e-signatures in most courts. If you are signing a private contract between two parties, you can agree on what types of signatures are acceptable. Put that agreement in writing, as in the statement of work above, so if the contract needs to be taken to court, the court can see that all parties agreed. If your contract or agreement must be registered with a court, you probably will be required to have original signed documents as counterparts. Disclaimer: The information in this article and on this site is for general understanding only, and it's not intended to be legal advice. Every case is unique, and laws and regulations change constantly. If you have questions about legal documents, discuss them with an attorney. What Is an Exculpatory Clause in a Business Contract? What Is Restraint of Trade and Non-Compete Agreements? What Makes an LLC Different From Other Business Types? The Difference Between Constructive and Actual Notice in Lawsuits? What Are Bylaws for a Corporation and What Should You Include in Them? What is an Injunction? How Does Injunctive Relief Work?